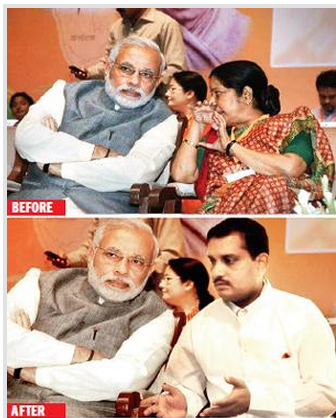 Cheap publicity - Adobe Photoshop is an amazing software - Picture shows Mr. Narendra Modi picture before and after editing. Dr Umashankar Mohanty obviously denies that he has done this! Controversy-mired Dr Umashankar Mohanty courts yet another one. The nation became coloured in a single swathe of tsuNaMo over the weekend and indeed provided an opportunity for a multitude of Indians to get into celebration mode. It also elicited, in equal proportion, a rash of warring comments on social networking sites. A photoshopped picture of the national president of the Indian Association of Physiotherapists (IAP), Dr Umashankar Mohanty, on his Facebook homepage is one such, which has elicited strong reactions from within the fraternity. Medical practitioners have not taken too kindly to this exhibitionism displayed by the head of IAP, and have voiced their displeasure on Dr Mohanty's facebook timeline. While one picture shows Dr Mohanty greeting the PM-designate warmly, another shows him in a cozy tete-a-tete with him. A physiotherapist from Aundh, Pune, India, was quick to share these images on his timeline to "show other members the level to which Dr Mohanty can stoop to garner eyeballs". His fetish for publicity has put us all to shame. This is simply embarrassing," he said. "He is our national president. He should be aware of the pros and cons of such an act. He can come under the IT and cyber crime scanner." Other physiotherapists from all over the country have posted comments varying from — 'it's a heinous act' to 'he is defaming IAP' to 'leave physiotherapy and look at photoshopping as an alternate career'. When Mirror spoke to some of the professionals, they reacted in unison to what they term an exceptionally childish act. "It takes away from his equity as a leader," said one. This does not befit the stature of the president of IAP." Dr Mohanty's career is dogged by controversy, one of them, said the physiotherapist from Sancheti, was when the election for the term of 2010-14 was declared invalid as Dr Mohanty had managed to fake votes and pump up the numbers in his favour. A case was registered against him at the Mumbai Branch of IAP and an inquiry is currently underway. The newest turn on Facebook has simply added fuel to the fire. On the other hand, Dr. Bhanwar Singh Takhar, the national vice president, IAP, decided to make light of the issue. "I have not been on Facebook for the last two days. But I must see this. It's funny how he did not waste any time to speak his mind on the just concluded elections in such a manner. However, he must also realise that he should not be copying and pasting such images as it could lead to serious offences too." In his defence, Dr Mohanty said, "It wasn't me who posted those photographs. My account must have been hacked." He cut the conversation short and refused to pick up our calls thereafter. "We would have been happy to arrange a meeting with Modi if the national president of a medical fraternity so desired. There was no need for a cut-paste job," offered Rajesh Pande, general secretary, BJP, Pune city. We would have been happy to arrange a meeting with Modi if IAP's national president so desired. Do proper Facebook security settings - top right corner click on down-arrow and do privacy, timeline and tagging settings. If you already know this, teach at least 10 friends. Additional resource: Study Facebook Do and do not presentation (already 1500+ views on SlideShare by Jyotindra Zaveri). Check before you outsource your social media management to 'companies' which has joined band-wagon without proper training or proven track-record. In other words the person who is posting the content needs to have that maturity to create content. After all social media works only if the content is good. 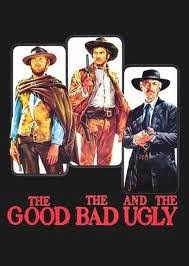 What do you say about the Good the Bad and the Ugly of social media?